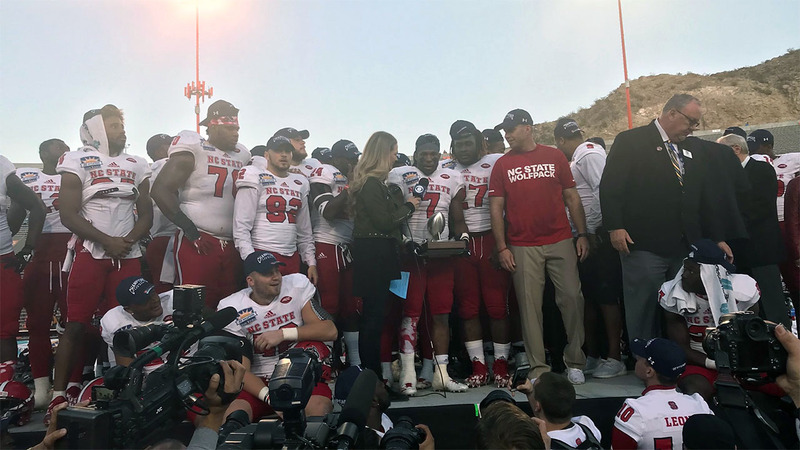 EL PASO, Texas -- North Carolina State's offense came up big in a Sun Bowl matchup that was supposed to be about defense. Nyheim Hines had three of North Carolina State's Sun Bowl-record six rushing touchdowns to help the Wolfpack beat Arizona State 52-31 on Friday. Hines' three scoring runs were all from 5 yards. "It just really goes to show how great our offensive line is," Hines said. "I'll definitely have to treat them when I get back to Raleigh." Hines was named the game's MVP. He helped the team score on four of five first-half possessions to fuel the rout. "Top 25 (in the College Football Playoff rankings) is the standard we want for this program," Doeren said. Arizona State (7-6) played its final game under fired coach Todd Graham, with former NFL coach Herm Edwards taking over the program. The Sun Devils had four turnovers. "I don't think we've turned the ball over four times all year," Graham said. "But give them a lot of credit. They're a very good football team. We just couldn't stop them." Manny Wilkins was 25 of 40 for 352 yards and three touchdowns for the Sun Devils. He also threw three interceptions. N.C. State played without defensive end Bradley Chubb. Chubb, a projected top-10 pick in the NFL draft, announced before the game that he wouldn't play. It marked the second year in a row that the biggest star at the game didn't play. Last year, Stanford running back Christian McCaffrey skipped it. Jaylen Samuels finished his career as NC State's all-time leader in receptions, passing Jerricho Cotchery, who had 200 catches from 2000-03. Torry Holt is third on the career list with 191 receptions from 1995-98. In his final game for the Wolfpack, Samuels finished with 7 catches for 46 yards. He also added a two-yard touchdown run. North Carolina State: The team's defensive experience showed. Even without Chubb, the Wolfpack limited ASU to 10 points through three quarters. Arizona State: Graham called the plays Friday. It wasn't a great showing for him. The offense was unable to run the ball. ASU had 469 yards of offense, but 21 of their points came in the fourth quarter. N.C. State's Chubb, the ACC Defensive Player of the Year, announced Friday morning he wouldn't play. "I just let them know that the decision I made is not anything about them," Chubb said in a CBS interview. "It's just looking out for myself. They all understood." Arizona State played without one of its leading tacklers, linebacker Christian Sam, who also sat out to prepare for the draft. Jay Jay Wilson had 13 tackles, but ASU missed Sam. The Sun Devils allowed 491 yards of offense. The Wolfpack ran 73 plays and had a 9:00 edge in time of possession. The 42 points scored in the fourth quarter set a Sun Bowl record for points in a quarter. The 45 points in the second half tied a game record, and the 83 total points was the second most in game history. N.C. State is 17-13-1 in bowl games and won its first appearance in the Sun Bowl. Hines is the first Wolfpack rusher to have consecutive 1,000-yard seasons since 1977-78. Receiver Kelvin Harmon had four catches for 24 yards, pushing him over 1,000 yards for the season. Arizona State is 14-15-1 in bowls and 3-2-1 in the Sun Bowl. Running back Demario Richard had 50 yards to become the first ASU runner with multiple 1,000-yard seasons since 1974-75. North Carolina State: Even though they will lose nine seniors on defense, the Wolfpack is still a team to watch in the ACC. They'll return nine starters on offense, including quarterback Ryan Finley, running back Nyheim Hines and four of the five starters on the line. The Wolfpack will open next season on Sept. 1 at home against James Madison.